ISOG-Technologies (formerly known as Feinmechanik Michael Deckel) in Bavaria, Germany produces world renown tool & cutter grinding machines. For applications that require grinding of engraving tools, diesinking cutters or other especially complicated cutting tools, there is no better solution than the DECKEL S0 and S0E single-lip cutter grinders. 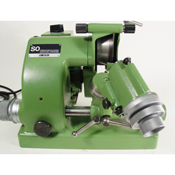 Since the company began serializing the SO grinder in 1958, over 28,000 grinders have been shipped worldwide and over 8,000 S0E grinders have also been produced. Click on individual products below for further details.